If you want to change the style of your xenforo you need to edit the EXTRA.css file. Don’t make changes to the files of xenforo, you may want to upgrade later. First you need to locate the admin area that deals with it. Click on Appearance from the top menu. Search for Customized Components in the left menu and click it. There is a search filed. Search for EXTRA.css and click it. 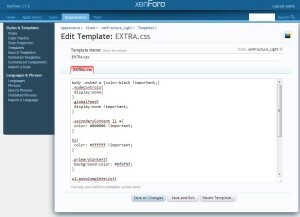 Here you can overwrite the main css of your xenforo forum.